NEW ORLEANS, LOUISIANA -- A young dolphin rescued in October is swimming in Barataria Bay, with a tag that will let biologists keep close tabs on him for the next six weeks. Biologists worry that the animal, dubbed Octavius, may be too young to survive on his own, state biologist Mandy Tumlin said in an interview. He was about 6 feet 4 inches long when he stranded. Though biologists think he's about 3 years old, he could be anywhere from 1 to 7 years old, according to a news release Thursday from the Louisiana Department of Wildlife and Fisheries. He appeared to be doing well after his release Thursday afternoon - he swam around a bit to get his bearings, then headed out into an area where fish were jumping, said Gabriella Vasquez, stranding and rescue coordinator at the Audubon Nature Institute. That's where Octavius has been treated since he stranded on Grand Isle - the island at the mouth of Barataria Bay where he was released. Tumlin said an agreement with the National Oceanic and Atmospheric Administration requires eyes on Octavius at least three times a week for two weeks, then at least once a week for four weeks. At first they'll check as often as the weather allows, Tumlin said. The tag attached to his dorsal fin has a satellite transmitter that will give his general location and an ultra-high frequency radio transmitter that will let them home in on him, she said. 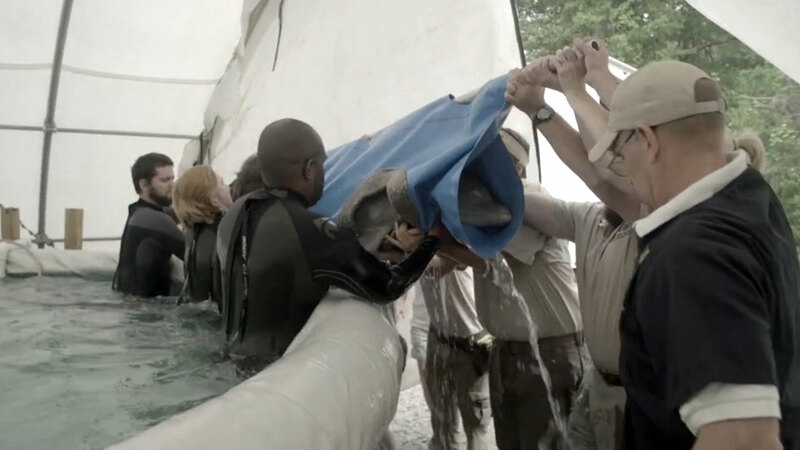 Octavius, named after a veterinarian who treated him, is the first dolphin rescued off Louisiana to be released after rehabilitation, said Audubon Nature Institute spokeswoman Katie Smith. Some died. A deaf dolphin and some rescued too young to have learned how to survive are now living at other facilities, Smith said. Scientists think Octavius was battered and exhausted by remnants of 2015's Hurricane Patricia. The 6-foot-long male was taken from the island in October as the storm was raging, half the island was flooded and nearby Port Fourchon was being evacuated. The dolphin's DNA showed that he's from Barataria Bay, Tumlin said. She said dolphins are territorial, so he'll likely stay around there. Rehabilitators worked hard to keep Octavius somewhat wary of humans. Rather than coming to the side of the tank to feed him, Vasquez said, they stood back out of sight and threw fish overhead. "When we would grab him for medical checkups, he did not like that: 'People poke me, they take my blood,'" Vasquez said. Octavius was driven Thursday from New Orleans to Grand Isle, where he was carried in a sling down a kayak ramp. Once the water was deep enough, "we dropped the sling, hugged him to our bodies, walked him out 20 or 30 more yards and let him go," she said. She said being able to watch Octavius swim free was "an incredible feeling. It's indescribable."